Former Dayton Dragons hurler Tyler Mahle pitched a nine-inning no-hitter for the Daytona Tortugas on Monday. The Cincinnati Reds prospect struck out six and walked none in Daytona’s 4-0 win over the Jupiter Hammerheads. He allowed only one baserunner, who reached after being hit by a pitch. 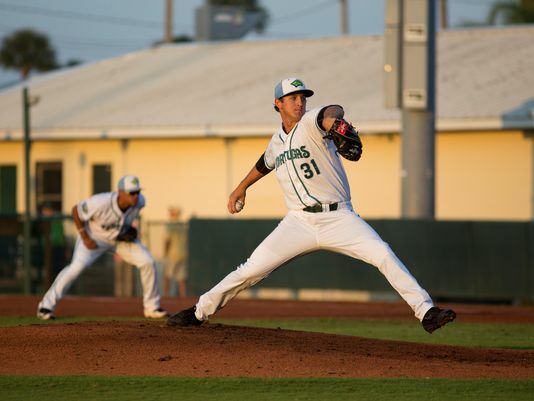 Mahle is 8-3 with a 2.50 ERA, 76 strikeouts and 17 walks in 79.1 innings (13 starts) for the Tortugas. The right-hander pitched in the Midwest League last year, going 13-8 with a 2.43 ERA, 135 strikeouts and 25 walks in 152 innings (27 games/26 starts) for the Dragons. Mahle is the younger brother of Los Angeles Angels LHP Greg Mahle, who made his major-league debut this year. Greg Mahle was a relief pitcher for the 2014 Burlington Bees, posting a 3.38 ERA with 38 strikeouts and 12 walks in 29.1 innings (18 games). This entry was posted in Burlington Bees, Dayton Dragons, Daytona Cubs, Florida State League, Jupiter Hammerheads, Midwest League. Bookmark the permalink.